AltaSteel happily employs 364 individuals who all live in, and in the neighboring communities, of Edmonton and Strathcona County. 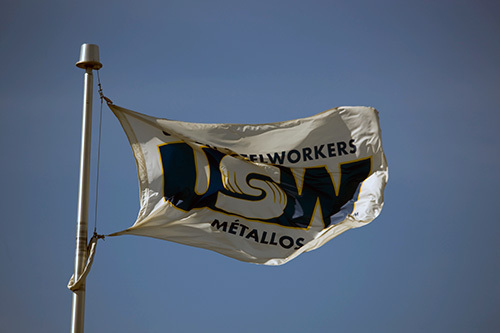 Of our employees 254 are members of the United Steelworkers Local 5220. We are a group of young to senior, male and female, local born and immigrant. We are proud of this diversity and seek to broaden it further. We continue to be in contact with our pensioners, many of whom live in Edmonton and Strathcona County, and are able to attend our functions. It is Altasteel’s belief that a strong community is built through interaction and we are a strong supporter of local business. Fun Fact: In excess of 90% of our business expenditure is with Canadian suppliers and over 70% is spent in Alberta. On a much broader level, we are pleased to provide quality steel to our Customers in Western Canada, South America and the USA. It is with pleasure that we are able to create a community that transcends geographical location, and allows us to help provide the material to help build other communities around the world. At AltaSteel we are very mindful of the impacts of pollution on our community. Not only do we recycle scrap metal as our raw material, but we carefully manage the impacts of our production process on the environment. There is a great write up on our Environmental initiatives in the Environmental Focus section of our website. We welcome you to take a look. 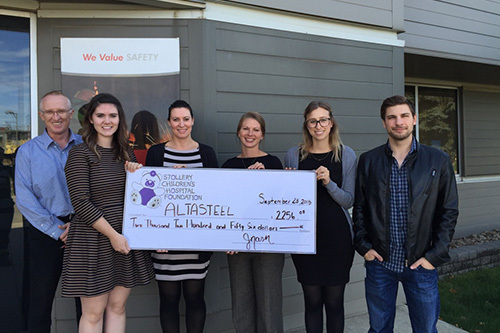 Whether it is through a Food Drive, Clothing Drive, Food Truck Fundraiser, Cookie Fundraiser, Bake sale or Barbeque, annually the AltaSteel community makes it a priority to fundraise for various charities in and around Edmonton. Some charities that we have been fortunate enough to have worked with include Edmonton Humane Society, the Children’s Stollery Fund, United Way, YESS, Santa’s Anonymous and the Food Bank of Edmonton. Fun Fact: AltaSteel has also been a proud contributor to the creation of the Capilano Skate Park located on Terrace Road at 98 Avenue. It is our belief that helping build up the community, through active participation, is essential to ensuring its sustainability. Corporate Social Responsibility involves a commitment to contribute to the economic, environmental and social sustainability of communities through the ongoing engagement of stakeholders, the active participation of communities impacted by our activities and the public reporting of policies and performance in the economic, environmental and social arenas. AltaSteel is a proud member of the Strathcona Industrial Association (SIA), a voluntary business organization that was formed in 1974 and works with communities and government agencies to promote a safe and healthy working and living environment in and around areas where member companies operate. As part of the SIA mandate, members operate an ambient air monitoring network, ensure emergency preparedness and land planning, and increase awareness of the industry in the community through a number of community awareness programs, including emergency response procedures. Visit the SIA website.